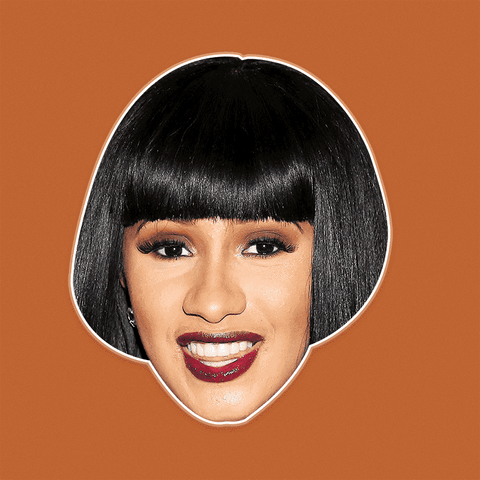 Backstory: Cardi B is a female rapper from Bronx New York who made waves around the world with her single "Bodak Yellow". Before rising to fame, she pursued a career as an exotic dancer at the age of 18 but she quit at 23 when she became a social media personality. She is the first solo female to have a rap song reach number one on the Billboard 100 since 1998. Cardi's real name is actually Belcalis Almanzar. She comes from the Bronx, although her family is of Trinidadian/Dominican descent. Her parents nicknamed her Bacardi, as a testament to her Caribbean heritage. Cardi B got engaged to Offset from Migos onstage during Power 99's Powerhouse at the Wells Fargo Center in Philadelphia. 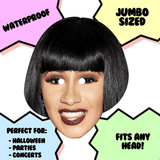 🤩DON’T JUST WEAR THE CELEBRITY, BECOME THE CELEBRITY - Make bloody moves with this Cardi B mask -- perfect for Halloween, concerts and parties.